An easy, healthy, delicious and fun way to eat hash browns and eggs for breakfast! These gluten-free "nests" are perfect for Easter or any occasion! My 15 month old absolutely LOVED these, as did I. 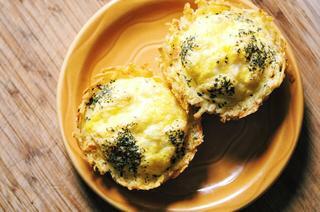 Combining an egg & hash brown breakfast into one yummy compact form turned out beautifully! They will certainly find themselves on regular breakfast rotation in our household. Whether you are looking for something new for yourself, or a fun breakfast project for the little ones, you will find that these are not only fun & easy to make...but oh so tasty & filling (and sure doesn't make a shabby Easter dish either)! An easy, healthy, delicious and fun way to eat hash browns and eggs for breakfast! These gluten-free 'nests' are perfect for Easter or any occasion! Preheat oven to 425°F.Grease a muffin tin, set aside.In a large mixing bowl, combine your fresh or thawed hash browns, cheese, garlic, spices & oil.Press your hash brown mixture evenly into your muffin tin, forming a 'nest' in each cup. Bake for 20 minutes, or until beginning to brown. Remove from oven, set aside & set oven temperature to 350°F.In a mixing bowl, combine eggs, milk, baking powder and your 1 tbs of parmesan cheese. Beat together well. Pour your egg mixture into each of your pre-baked hash brown nests. Sprinkle with dried cilantro. Bake for 20-25 minutes or until eggs are firm, puffed and beginning to turn golden.Let cool for a few minutes before gently lifting out of your muffin tin to serve. Enjoy!